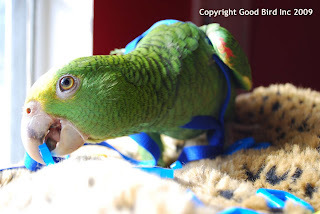 Apparently Jackson the Blue Throated macaw has modeling experience. It seems more often that not he strikes a very specific pose. It’s almost as if he has rehearsed it. Hmmmmmmm. Judge for yourself! 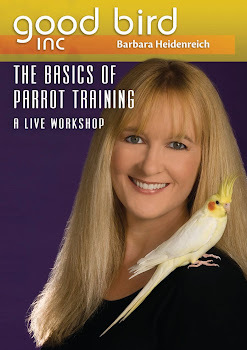 Not too many things compare to a great day of parrot training for me. And today was one of those days. 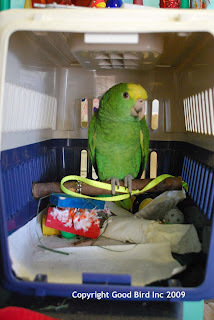 Crate training is an important behavior for the two baby parrots, Jackson and Joker. They both traveled from the breeder to my house in crates. Both seemed pretty comfortable in the crates for the four hour drive, but the next day they were a bit hesitant to consider entering a crate again. (Four hours in a crate was probably a bit more than they were ready for) Since then I have been working on retraining the behavior. 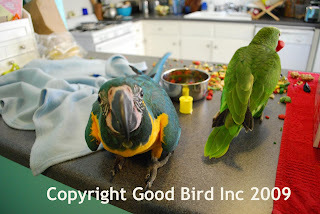 I was very pleased today when both parrots entered their kennels voluntarily. I had to break it down into small steps. 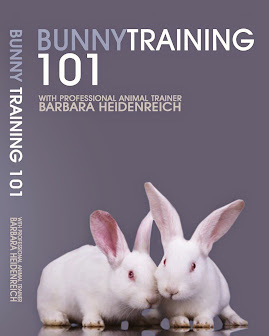 In other words I reinforced with treats and attention any movement towards the crate and eventually stepping inside it (Find more details on training this behavior in my second DVD Training for the Veterinary Exam). 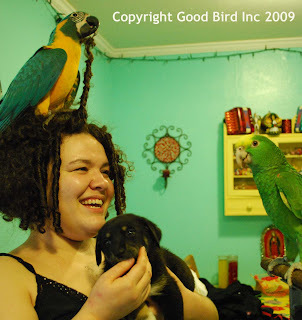 Joker, the Amazon parrot, was by far the star on this behavior. I had also loaded the crate with toys. He kept running in and out to play with different toys as well as get treats. 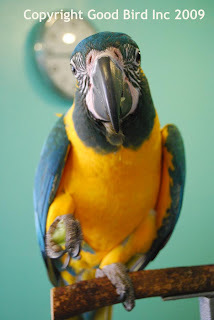 At one point I worked with Jackson (the macaw) on another behavior in another room, Joker was being so quiet I had to check on him. There he was asleep on his perch inside the crate! The door was off the crate so he had the choice to be anywhere at all, and he chose to be in his crate. Woohoo! Jackson also was a training superstar today. 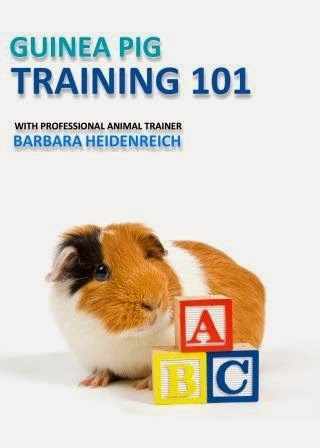 The behavior at which he excelled was harness training. 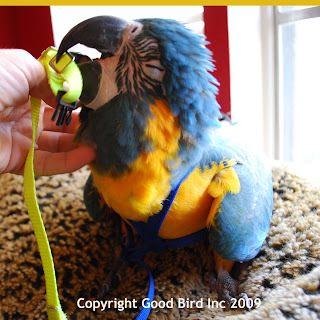 Harness training can be a really difficult behavior. It often involves some manipulation of the wings to achieve. 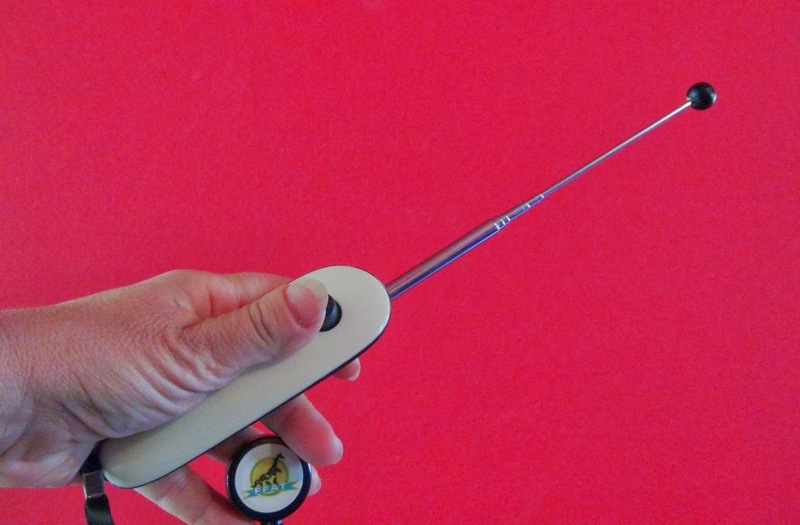 Many parrots are not too comfortable with this. Because of this it is really important to focus on pairing positive reinforcers with the situation. Fortunately Jackson is a sucker for a good head scratch. He practically melts. Using head scratches as his reinforcers Jackson sat calm as can be while I gradually adorned him with his harness two times. It is really important that Jackson views this behavior as something that results in copious amounts of good things. And right now he is learning harness time, means scratches galore. Joker is also working on the harness, but doesn’t respond as enthusiastically to head scratches as Jackson. This means using other reinforcers to train this behavior. One reinforcer Joker likes is playtime. He will roll around on his back and kick his little feet up in the air. Right now I am pairing the presence of the harness with playtime, toys and also food treats. He is progressing a little slower than Jackson on this behavior, but his excellent crate training makes up for it. 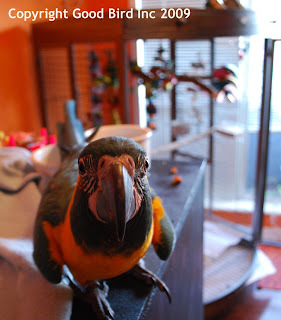 My reward was some playtime with both birds after our nice training sessions. 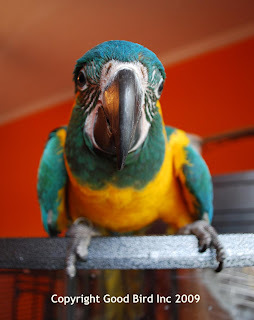 Having a baby Blue Throated Macaw (Jackson) and baby Double Yellow Headed Amazon (Joker) parrot in the house is fun. And apparently it is fun for them too. 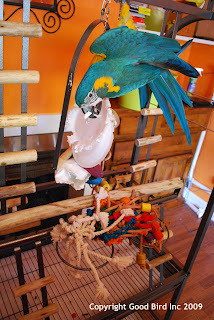 I like to think so as my house has a number of very entertaining play areas for parrots. There is this super cool play stand, perches all around the house, and two training areas loaded with all sorts of toys and treats. So when the sun rises, the birds are ready to stretch their wings, participate in some training and play, play, play. This makes for a great morning for the birds, but at some point they do need to return to their cage for a little down time for everyone. This can be a challenge when being outside of the cage is such a blast. Why go back inside if all the fun happens outside? When I felt one of the birds leaning back on my hand when I approached the cage one morning, I knew it was time to take action. 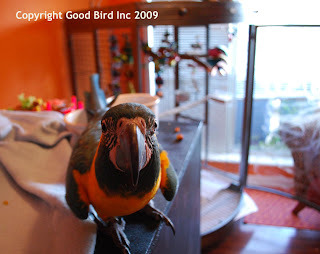 If I forced the bird into the cage, I pretty much knew I was asking for trouble. What would happen is, in the future the birds would be even more hesitant to go back inside. Instead we had a training session right then and there. As soon as I felt the lean, I stopped in my tracks and took a step back from the cage. When Jackson’s body language relaxed I gave him some head scratches for sitting calmly on my hand while we were close to the cage. Over time we were able to get closer and he even stepped on a perch in the cage for a treat. I then let him step right back on my hand and come back out. We repeated this until he was back to stepping into the cage easily. He learned going in the cage doesn’t mean all the fun stops. I now also rotate different toys into the cage, so that every time he goes back there is a new toy to play with. This helps keep this behavior strong. Because this behavior can be challenging, I know I will always be careful to look for body language that says the bird is uncomfortable. And if I see it I will slow down and go through these steps again. This will be important to helping to maintain that behavior for the long haul. For now I am also going to be sure to give myself plenty of time to return the birds to their cages, just in case I see any hesitation. I don’t want to have a set back by not planning ahead. My blog has been kind of quiet lately. But my house hasn’t! Both are the result of some new visitors to my home. Two baby parrots. 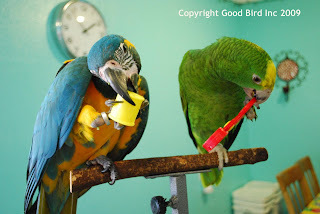 Jackson is a young Blue Throated Macaw and Joker is a young Double Yellow Headed Amazon parrot. 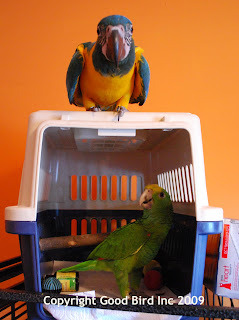 Because of their role in education there are some specific training goals I am working towards with these two birds. They are both flighted and will not only educate at the Kaytee Learning Center, but also at special events. This means both birds need to be comfortable with travel, be comfortable wearing a harness and interacting with new people in new environments. 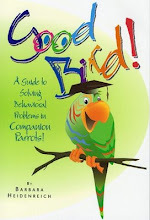 For some birds, those can be challenging behaviors. With Jackson and Joker being youngsters they are a little more receptive to change at the moment. I am taking advantage of this time in their development and exposing them to many new things and pairing these experiences with positive reinforcers. They recently met two new people and also some puppies! Both birds responded as I had hoped. No fear whatsoever…….just a bit of curiosity. They flew to new people for treats. However they soon discovered playing with one new friend’s curly hair was more tempting than a treat. I had to spend the next day teaching Jackson that other places were for perching….not heads. It is an easy trap to fall into. A parrot flies to someone’s head and starts to have all sorts of fun. That makes flying to heads reinforcing. This means that flying to heads is likely to happen more often. To address this the following day, whenever Jackson tried to fly to my head, I simply stepped aside. He is a very confident flyer at this point and remained aloft and looked for another perch. As soon as he landed I reinforced him. This quickly got him back on track. It was now hard to land on a head and super easy to land somewhere else. Plus you get a treat for it. Problem solved! These two young parrots will be with me for a number of weeks. I will continue to post on their training and their progress. Keep checking back for updates!